Although articles in this volume fall into three thematic clusters, each of those groups exemplifies three general themes: micro-social processes; innovations and the question of continuity versus discontinuity; and the relationship between ideas and practice. Most of these essays touch upon, and some of them are exclusively concerned with, small scale social processes: e.g. the routines of the all-female early-modern childbirth ritual, the different ways that male practitioners were summoned to such occasions, the functioning of voluntary hospitals, the protocols underlying patient records. Such social practices are well worth studying as both the sites and drivers of larger-scale historical change. Whenever there comes into being something new - whether an institution (a hospital), a social practice (the summoning of men as midwives) or a concept (a new approach to disease) - the question arises as to its relationship with what went before. This concept resonates throughout these essays, but is most to the fore in the chapters on early Hanoverian London (which asks explanatory questions) and on Porter versus Foucault (who represent the extremes of continuity and discontinuity respectively). A couple of generations ago, the ’history of ideas’ was pursued largely without reference to practice; in recent times, the danger has appeared of the very reverse taking place. This book ranges across a broad spectrum in this respect, the emphasis being sometimes upon practice (Eleanor Willughby’s work as a midwife) and sometimes upon ideas (concepts of pleurisy across the centuries); but in every case there is at least the potential for relating the two to one another. None of these themes is specific to medical history; on the contrary, they are the bread-and-butter of historical reconstruction in general. Contents: Introduction. Part 1 Childbirth and Midwifery: William Hunter and the varieties of man-midwifery; The ceremony of childbirth and its interpretation; A memorial of Eleanor Willughby, a seventeenth-century midwife. Part 2 Medical Institutions: The politics of medical improvement in early Hanoverian London; Conflict, consensus and charity: politics and the provincial voluntary hospitals in the eighteenth century; The Birmingham General Hospital and its public, 1765-79. Part 3 Medical Concepts and Practices: On the history of disease-concepts: the case of pleurisy; Porter versus Foucault on the ’birth of the clinic’. Index. 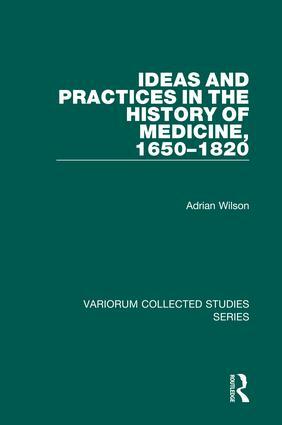 Adrian Wilson is Senior Lecturer in History of Medicine at the University of Leeds, UK.